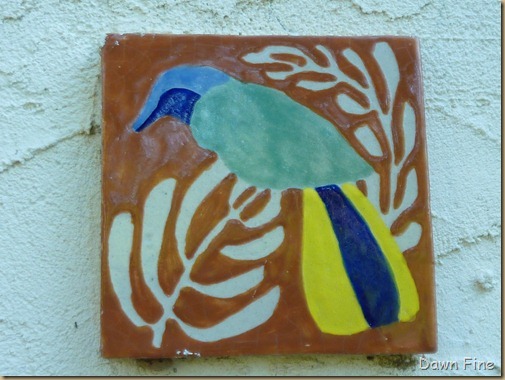 Guess what we did today?…..Yep..More birding. 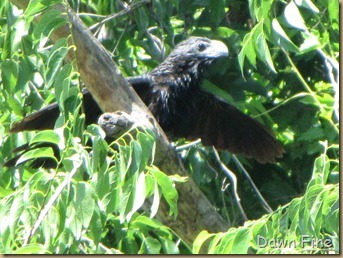 We returned to Santa Ana in hopes of finding the Hook-billed Kite. 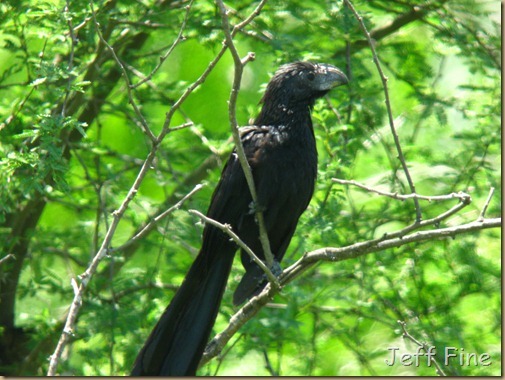 We didn’t find the Kite..we did see lots of other birds..
For the second time in two days we saw the Groove-billed Ani..
An couple from Great Britain had noticed one as it went for a drink in the dike.. 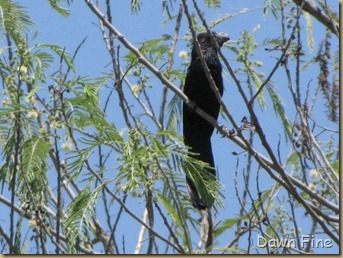 This bird from a distance could be mistaken for a Great-tailed Grackle..
We had fun watching both birds for over a half hour… I wanted to visit Quinta Mazatlan in McAllen. Christopher from Picusblog suggested we visit…Thanks Christopher! What a great little park in the middle of town. 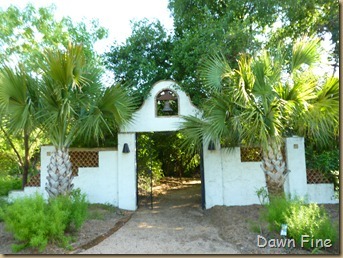 Garden Gate.. Green Jay tiles on either side of the gate.. We followed the trails…a small but very nice park.. 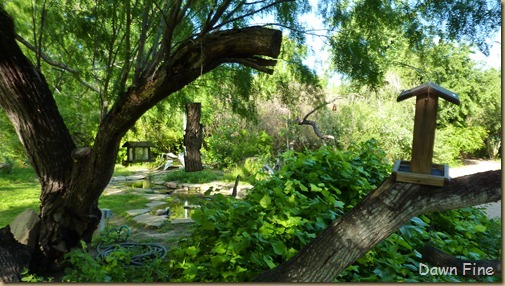 Feeding stations set up in many areas of the garden..
Lots of nice water features as well.. 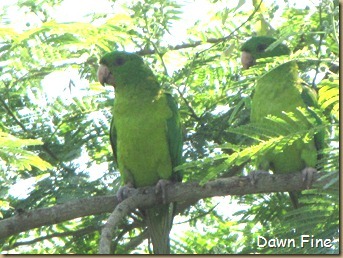 While sitting and watching birds near the feeders…we heard some squawking..
Green Parakeets…Life Birds.. 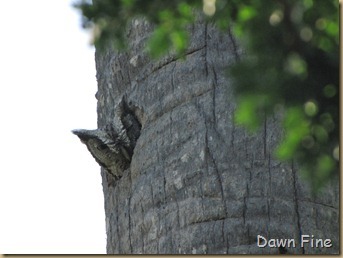 They looked like a very nice couple…cuddling and kissing.. On our way out of the park, I stopped to look at a Golden-fronted woodpecker..
Until I looked at it with my binos..
Eastern Screech Owl…Life bird! Does anyone know what type of fungus this is? 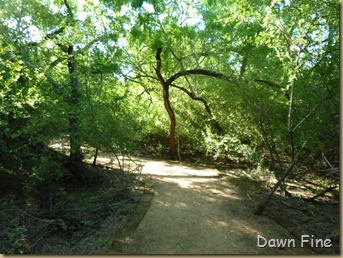 Another Great day of birding in the RGV of Texas! 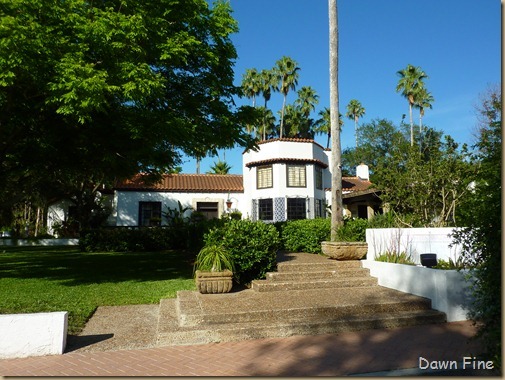 Isn't Quinta Mazatlan terrific? 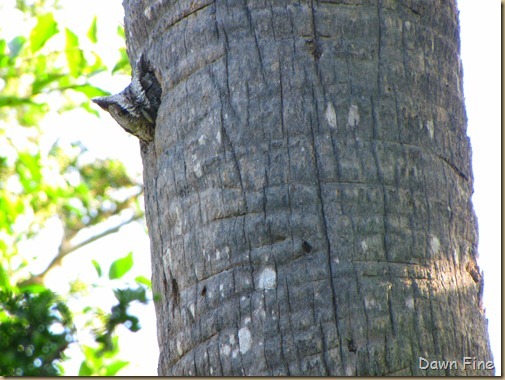 When I visited the RGV a couple of years ago, I heard a rumor that the local screech owls may one day be split from the Eastern race. 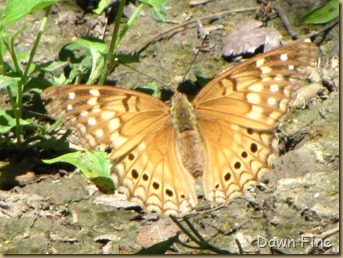 So as long as this first one isn't your last, you may get more than one lifer out of it! Beautiful pictures. Aren't the tiles on the gate wonderful? And that owl! He certainly has a good method of hiding. wow that owl is cool! Congrats on all your life birds. The parrots are cute. 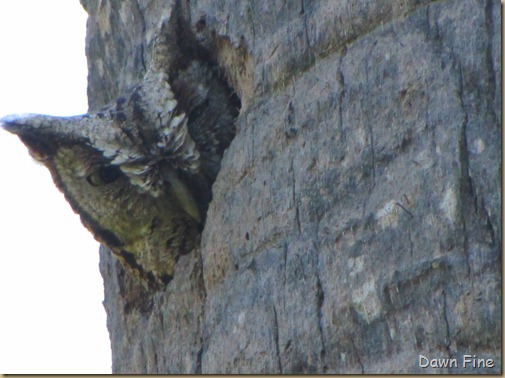 Neat sighting of the Screech Owl. Looks like you had another great day of birding. What a cool list Dawn!! I really enjoyed seeing those two black birds that I never heard of 😉 And I thought that little park was so very cool! How amazing that owls looks so much like the trees they live in – wow! Congrats on the lifer screech, Dawn! WOW amazing! I particularly love the owl peeking out!! Great shots! You find the most amazing birds wherever you go. 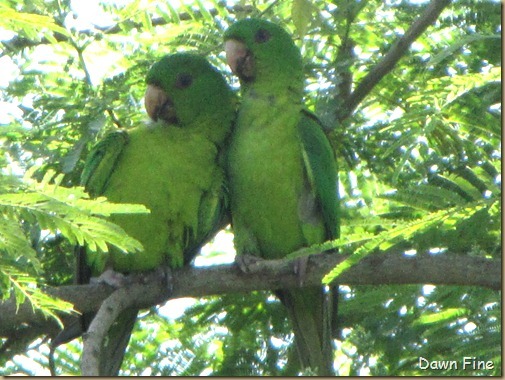 I've seen the parrots near my Mom's house in SanBenito. Guess I should do more exploring when I visit there next winter. Those Groove-billed Anis are just crazy-looking birds! And I could just hug those kissing parakeets; how utterly adorable! 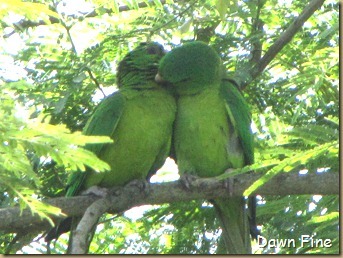 Love the kissing green parakeet couple. We see them in St Pete, but they are never this close. Wow! Looks delightful. I love the parrots kissing and nuzzling and the double grooved are well, groovy. I'm so jealous of the owl! The fungus looks like someone had a mustard accident. great post and pics. love the owl, great spot. Congrats on the lifer Eastern Screech-Owl. Always great to catch a glimpse of these little guys. DAwn, I just cannot believe your luck with the birds! An eastern screech owl? MY word! I'm green with envy! Maybe the parrots will accept me with their flock! 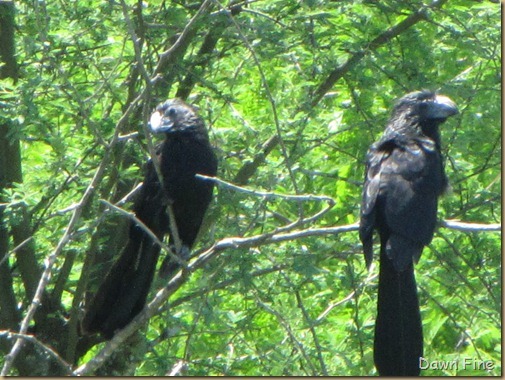 Love the groove-billed Anis. Quinta is sure nice..we really had a great visit there.. Rumor of a split..cool…will go looking for another Eastern Screech..why the split? Thanks Bobbie, looking forward to some catch up of your blog..this birding has given me little time for blog reading..Looking forward to your shadow shots and cartoons! Thanks dear blogger, rv friend..cant wait to catch up with your travels..this birding has me burning the candle at both ends..ouch..headed to NC now and blog reading time.. Thanks..How do u keep up with all the blog reading you do? Amazing..
Howdee newly married and newly relocated Mel, hope all is well with you.. I wanted to take that cute little owl home. 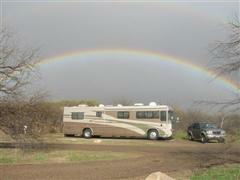 Thanks Bird Girl..it had been a blast birding in TX..we are now headed north to NC…and time to read my fav. blogs! hee hee..wasnt that the cutest little ball of feathers! Hee hee..I could hug them too..adorable..
i wanted the little owl to take home..Hope your Florida birding is hoppin with migrants. Thanks..We were lucky to see them as close as we did. I didnt realize how affectionate they were. 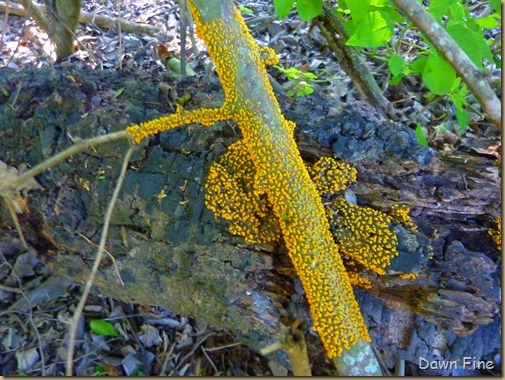 hee hee you are funny..mustard accident fungus.. Thanks Kathie..I do wish you were here with us..I know we would get soooo excited together..I needed you a few times to capture the photos before the birds flew away..
Hope to see you in CT! !